WASHINGTON, DC -- Just days before President Barack Obama was set to arrive in Germany for a summit of the seven major industrialised nations, Russian-backed separatists in Ukraine broke a months-long cease-fire by launching a major artillery barrage. 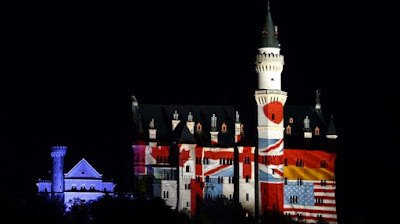 The castle Neuschwanstein near the small Bavarian village Fuessen, southern Germany, displays the national flags of the G7 countries ahead of the G7 summit at Elmau Castle. The fighting killed two dozen people and seemed timed to send a message to the United States and its allies that Russia and President Vladimir Putin can't be ignored. Mr Obama will arrive in Germany on Sunday for the annual Group of Seven (G7) summit, where a major goal will be to strengthen support for tough sanctions designed to punish and contain Putin. "We in no way are trimming our sails with respect to our strong opposition to Russian policy in Ukraine," said Ben Rhodes, a deputy national security adviser. Mr Obama's challenge over the next few days will be very different from last year's G7 summit, which came shortly after Putin seized Crimea. At that time the Ukraine crisis was still in its "acute phase" according to Richard Fontaine, president of the Centre for a New American Security. The world's major industrialised nations had barred Putin from attending the annual meeting, which had previously been known as the G8, and support for tough sanctions against Russia remained strong. Now the battle in Ukraine increasingly looks like a frozen conflict. Mr Obama's challenge will be persuading European leaders, who are under pressure from industry to loosen the sanctions, to keep punishing Russia. Mr Obama faces his own pressures when it comes to confronting Putin. The Americans will need help from the Russian leader to resolve the conflict in Syria and Iraq, where Islamic State militants have been on the march. Putin is also a key player in the negotiations with Iran over its nuclear program. Both of those issues will be discussed by world leaders at the G7 summit, to be held at Bavaria's Schloss Elmau resort on Sunday and Monday. The war in Ukraine, however, likely will dominate discussions at the summit, which includes the leaders of Canada, France, Germany, Italy, Japan and Britain. US and European officials said they are still clinging to the hope that a cease-fire negotiated with the Russians and their separatist proxies in Minsk earlier this year can stop the killing. This week's renewed violence underscored both the fragility of that accord and the failure of the economic sanctions to alter Putin's behaviour. Russian separatists attacked with heavy weaponry that was supposed to be pulled back from the front line under the terms of the Minsk agreement. Ukrainian President Petro Poroshenko, meanwhile, said his country faced the "colossal threat of the resumption of large-scale attacks by Russian and terrorist forces". Mr Obama reassured Mr Poroshenko in a phone call on Friday that the United States remained committed to keeping the pressure on Russia. The bigger challenge will be maintaining unity among US allies in Europe as the conflict continues to grind on with little prospect of a resolution. The sanctions as well as the drop in oil prices have badly hurt the Russian economy over the last year. Putin is also facing pressure from his own people, who don't want Russian soldiers dying in Ukraine. So far, though, the Russian leader seems to think that he can keep the conflict at a low boil and wait out the US and its European allies. "Putin knows full well, kind of, what buttons he'd have to push to incur additional punitive measures and feel the weight of the West," said Julianne Smith, a former senior Obama administration official. "For that reason, I think it's unlikely that he'll make a big, bold move. "I think it's more likely that he'll let violence unfold in smaller pockets."